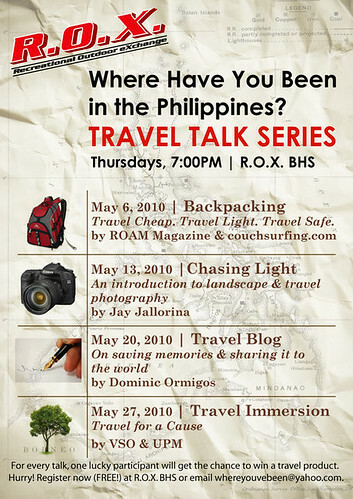 inviting you to a series of talks on travel at Recreational Outdoor Exchange "Where Have You Been in the Philipppines?" Bonifacio High Street Taguig. see you there. Dong, what type of camera do you use? Gumaganyan na talaga si dom... speaker na! Sayang lang kasi di talaga ako pwede sa mga ganun... Congrats in advance para dyan! wow, speaker ka pala. congratulations. i've never been anywhere in the philippines which is a shame, shame shame. You're really kicking it up a notch now. Congrats! I know you've got plenty to share and talk about. Mostly Luzon.. Actually, Luzon lang talaga ang napuntahan ko here in the Philippines. Galing, speaker level ng seminar ka na kuya Dominic! Hehe. parang gusto ko pumunta dun sa travel blog talk... pwede bang kahit yun lang yung puntahan ko sa series na yan? This couch surfer is very curious about this. That looks like interesting talks... will see if I can make it. wow, speaker! good luck, dom! i'll see you on the 20th! I would have found this talk interesting! So how did it go?